Luxuriating — Avigail S. Oren, Ph.D. The liminality I discussed on Tuesday comes with one small silver lining—along with a transition of task comes a transition in schedule. Although I will have a ten-week internship this summer that requires me to work regular business hours Monday-Thursday, it will be the exception for the next three years. While dissertating, I can set my own schedule. Unless I am teaching, I do not have to go to campus. I can work when I want, where I want, with whomever I want. I do get a significant amount of work done in my office, but it’s a depressing space. All of the grads are housed in one large room that’s divided into four rows of cubicles. There are no windows and thus no natural light. The fluorescent lighting has a yellow cast that makes everyone in there look like they’re experiencing liver failure. It’s a decent place to spend a few hours writing during the winter, when you know that everywhere else is just as depressing and possibly not as warm. 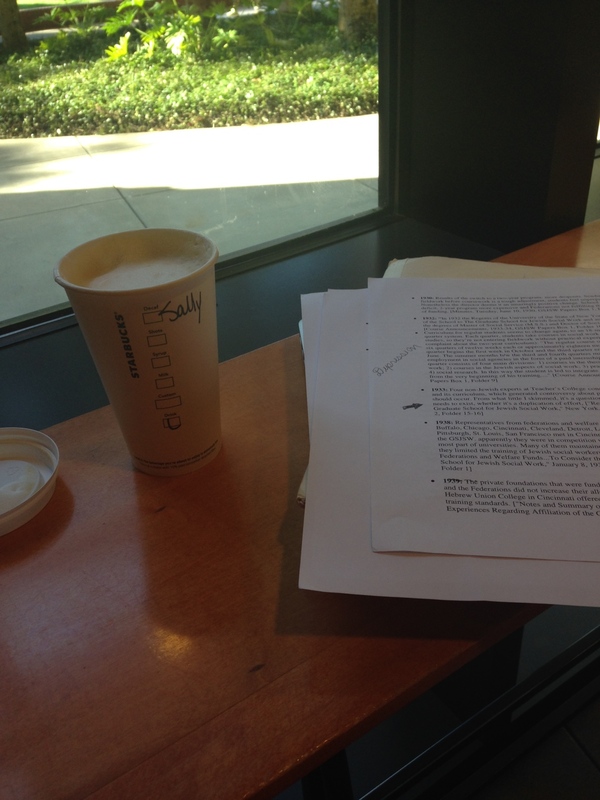 When the weather is nice, I much prefer to work at a well-lit coffee shop—my favorite spot even has an outdoor patio! I find that I write best when I move locations day-to-day. It’s nice to have new scenery. These days, I’m really enjoying the process of waking up slowly, walking to a coffeeshop slowly, and drinking a latte really slowly. Easing into the day is such a luxury. I have nothing urgent to do, and since I work for myself I set my own goals and deadlines. And right now, I’ve decided that everything can be done slowly. I trust myself, and I am confident that everything will get done.